This coming Saturday is a very special day. It's also a very scary day for 9 amazing women. 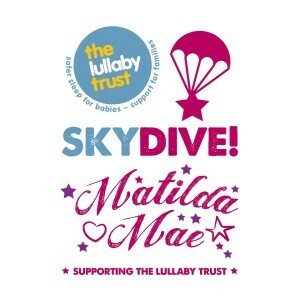 They are jumping out of a plane to raise money for The Lullaby Trust in memory of beautiful Matilda Mae. However, it's nowhere near as scary as every Saturday that Jennie faces. If you follow my blog or are part of the blogging community you will know the story of my friend, and fellow blogger, Jennie. We shared our pregnancy journeys together - me with Tiny Ched and Jennie with her miracle daughter, Matilda Mae, who was born just a month after TC. Sadly, Matilda was taken away from Jennie, at just 9 months old, on Saturday 2nd February by Sudden Infant Death Syndrome (SIDS)... more commonly known as cot death. Somewhere you expect your baby to be safe. But for many parents it isn't. Each year, in the U.K., over 600 families are torn apart because of the devastating loss of a precious child to SIDS. Each year these families go through the unimaginable pain that no parent should have to go through. The Lullaby Trust work tirelessly to help support these families on this terrible journey. Their work is vital to not only offer this support but also to raise awareness of SIDS and do all they can to help prevent it. Anyone who's followed Jennie's personal story will never forget Matilda Mae. I think of her every day and I never had the pleasure of meeting her - I'd only met Jennie before when we were both pregnant. 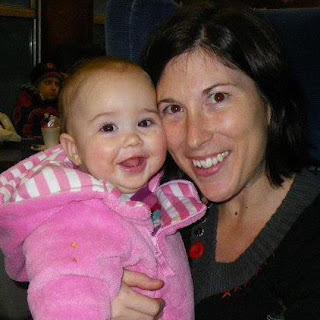 I've spoken publicly about Tilda twice now on behalf of the blogging community and all the beautiful photos Jennie took in her 9 short months are etched in my memory. A little girl with such a short life but a little girl who has left a lasting impression. A legacy to be proud of. A legacy to shout about. A legacy to raise thousands of pounds for The Lullaby Trust. A legacy to jump out of a plane for. Yes, Saturday is a very special day. The Matilda Mae Sky Dive will be incredible. These women, a few I've never met and a few I have a couple of times (and now are lucky enough to call friends) are doing something so amazing, something so brave, something that deserves to be shouted about. Something that deserves to be sponsored. Also, one of these ladies has a very special place in my heart. We both attended Matilda's funeral back in March. Although we had met previously, it was only once when we were both pregnant. We then spent the best part of 2 days together, sharing tears and support (and an amazing roast dinner made by her lovely mum) and becoming friends. Suzanne's blog post really sums it all up. We held each other up when we stood up and spoke about Tilda's legacy. 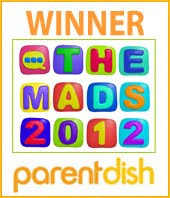 Then we did it all again last month at BritMums Live. Suzanne and I always shed a tear whenever we meet up now, as we remember, but we also share smiles and laughter. And hugs. Lots of hugs. I've made a friend for life. She is an amazing lady, and I know the other 8 (also amazing) ladies jumping with her will look after her for me as I can't be there this weekend. These 9 ladies are going to jump into the sky. The sky is somewhere I look when I think of Baby Tilda and on Saturday my eyes will be up in the air most of the day...remembering Tilda and thinking about what these incredible women are doing to raise money. Please can I ask that if you haven't already sponsored them, can you? Even the smallest amount will go a long way to raise money for The Lullaby Trust. Can I also ask that you spread the word by mouth, by social media, by email...hell, even pick up the phone...call, text...do whatever you can to get people to raise money. 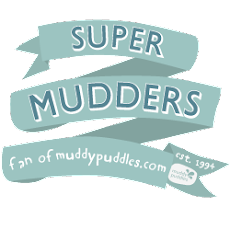 The link for Team Matilda Mae Sky Dive is here. Please sponsor and pass it on. If you're using social media, please use the hashtag #MMSkyDive. Please let's make this hashtag trend on Saturday. Also add in @LullabyTrust to Twitter to raise awareness of the charity. Shout about the sponsorship, let's make as much noise as we can! Let's help raise as much money as we possibly can for The Lullaby Trust and their incredible work. Let's support these 9 amazing women as they take to the sky on Saturday. Let's continue the legacy of a beautiful little girl lost. Lost but never EVER forgotten.